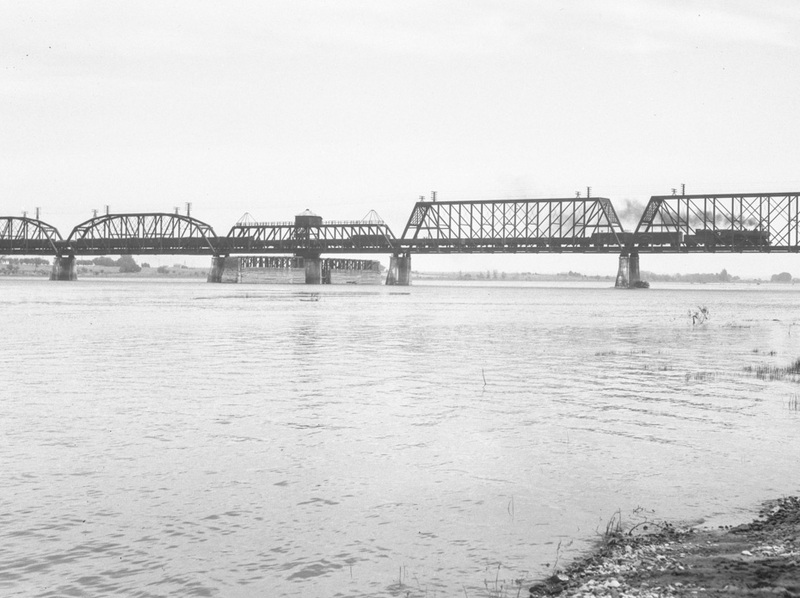 This 1940 Alva Day shows a freight train crossing the Columbia. Does anyone recognize the bridge? Where ever it is it isn't in a very populated area. It look like the bridge near Maryhill. Oh look Arlen!! A train with smoke. Great picture Arthur....and I thought Christmas had passed.....doubt it is the Celilo bridge as the ship passage wasn't in the center...it was/is on the south end of the bridge near the canal. I checked the railroad bridge near Celilo last week. The spans are quite different and I don't think there is an angle which wouldn't show gorge cliffs. This picture was taken in 1940 before the Dalles dam. Wasn't the bridge redone after that. Looks to be an eastern dryland area, but there are no cliffs to be seen. Maybe near what are today the Tri-Cities? Interesting that two different styles of trusses are being used. Maybe one end of the bridge has been somehow damaged and rebuilt prior to this picture being taken. Here is a photo of the Kennewick-Pasco bridge with a lift span. Note that it has two different truss designs as per today's photo. Here is a pic when the K-P bridge still had its swing section instead of a lift. This article on the Northern Pacific railroad bridge at Pasco/Kennewick has a tiny photo of a bridge that could possibly be this one. The bridge was designed with six Parker through truss and four Warren through truss spans. The Parkers are the curved ones. The Warrens are the straight ones. If I could add a smiley face I would. It might not be the K/P bridge but I learned about trusses. The previous link I gave says the drawspan would pivot. This link tells about the types of trusses. If this is the Pasco-Kennewick Railroad bridge----then I give a thumbs up to Alva Day and Arthur. I think they have just provided the internet with the best historical photo of the bridge. I'm going to take a wild guess and say it's the North Bank Bridge from Vancouver to Portland. That bridge was two miles long and very well could have hade both Parker & Warren trrough trusses. Ship chanel looks more correct. Probably an Spokane, Portland & Seattle (SP&S) engine. The 1905 NP bridge at Pasco was changed in the 1950's from a swing span to a lift span so this could be it. It also has both parallel and polygonal top chords as in your picture. It and the UP bridge there both had the opening spans in the center. "acmemapper2.1" should show it all but I am having trouble with this machine at this time. Originally there was a 2487' wood span here until this 1883 built steel bridge was moved here from the Missouri crossing at Bismark ND. The difference in top chords may be because it was partially rebuilt with 250' spans from Japan in 1983. Definitely not Celilo. Just look at the surrounding land and you don't have the rim rock. Definitely in a more flat area. A bit of local rivalry?? Roger...Someone here, more knowledgeable about trains than I, will know this better, but I think the swing span on the Portland/Vancouver railroad bridge was not in the center. It was close to the north (Vancouver) shore. Definitely the Pasco-Kennewick bridge, there is a good picture posted on google earth. It has the polygonal top chords on one side of the draw and parallel cords on the other. This is not at all like the Vancouver or Celilo bidges as both have the draw near one end, and the next RR bridge upstream from Pasco, the Milw Road at Beverly, is a deck truss rather than a through truss.